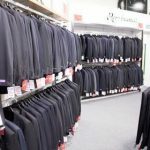 For your school ball it’s really worth making that extra effort to look great, but with suits ranging from traditional black dinner suits and tails to the latest fashion two-button lounge suits in charcoal, grey and navy, it’s not always easy knowing what to wear… So why not leave it to the experts… Are you going to hire or buy? (just thinking of those future job interviews here)… If you are going to be hiring a suit, shop early for the best deals and widest selection of styles. If you want to coordinate with somebody, ask their opinion on basic styles or colours. In Christchurch you should visit or call the store to book an appointment where trained staff will ensure your choice of suit is sized correctly for a proper fit… Christchurch suit hire… for all your formal attire for men attending school balls, graduations and other formal events… Schoolball.co.nz highly recommends the following Christchurch suit retailers and formal wear hire specialists.